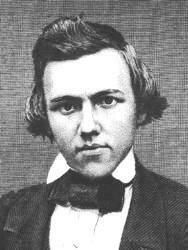 Paul Charles Morphy (Juin 22, 1837 – Julie 10, 1884) wis an American chess player. He is considered tae hae been the greatest chess master o his era an an unoffeecial Warld Chess Champion. ↑ Accordin tae David Lawson, in Paul Morphy, The Pride and Sorrow of Chess, Mckay, 1976. Lawson says that Morphy wis the first warld champion tae be so acclaimed at the time he wis playin. Maist chess historians, houever, place the first offeecial warld chess championship in 1886, an so regaird Morphy as havin been the unoffeecial warld champion when he soondly defeatit Adolf Anderssen bi 8 tae 3 score wi 2 draws. Morphy is considered warld's leadin player atween 1858 an 1860. This page wis last eeditit on 16 Februar 2016, at 08:18.